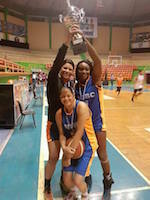 Nacional de Ingenieros triumph in Liga Mayor de Baloncesto sweeping the Finals against Mystics. In game 2 Nacional de Ingenieros posted a 55-45 victory to win the series 2-0. In game 1 they celebrated another 10-point difference win, 52-42. Last year Nacional de Ingenieros conquered the title of Torneo Mayor Femenino 2015. They won the Final series over Mystics 2-0.